ww2dbaseBorn in the village of Strelkovka sixty miles south west of Moscow, Russia to a shoemaker, Georgy Konstantinovich Zhukov was a member of a poor family. In his teenage years he was an apprentice furrier to his uncle before being drafted into the Russian Imperial Cavalry. 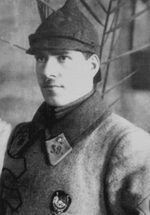 During WW1, Sergeant Zhukov was twice decorated with the Cross of St. George for his bravery. During the Bolshevik Revolution of 1917, he led the Red Army's cavalry; in Mar 1919, he officially joined the Communist Party and became deeply indoctrinated in the communist ideals. Even during his friendship with Dwight Eisenhower immediately after the end of WW2, Eisenhower noted his sincere devotion to Marxist ideals during their philosophical discussions. 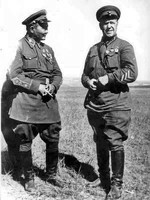 Zhukov's quickness to react on the battlefield led him to be noticed by Joseph Stalin, then a member of the Revolutionary Council. In the 1920s and 1930s, he was regularly given coveted roles in the Red Army, such as being one of the first tank commanders in the Soviet Union. ww2dbaseDuring the conflict with Japan, the stocky Zhukov with his closely cropped hair led a mixed Russian and Mongolian unit in a successful defense against Japanese troops at Khalkin Gol in Jul and Aug of 1939. In Mongolia and Manchuria regions, Zhukov's units inflected significant Japanese casualties, halting the Japanese advance, and might have contributed to Japan's fundamental change in philosophy, expanding across the Pacific instead of deeper into continental Asia. At the end of the war with Japan, Zhukov was promoted to the rank of general, commanding the Kiev Military District. ww2dbaseZhukov met Stalin in Jan 1941 after a war game exercise, in which he won a mock battle that he was not supposed to win. 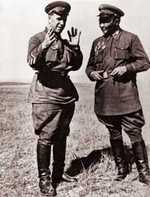 Zhukov's leadership abilities and his popularity with the common soldiers made Stalin's feelings toward him uneasy. 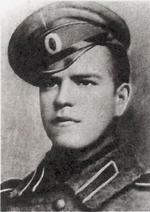 However, Zhukov kept his rank due to his impressive skills. He was one of the very few men who could voice opinions against the Soviet premier and live to tell the tale. Zhukov was a decisive leader who took the time to study battle details and was the type of leader who required absolute and unquestioning loyalty from his troops. He was also known to be an absolutely ruthless commander when he needed to be; for instance, he did not think twice when he sent entire penal battalions marching across a minefield as a method to clear enemy mines. He was also known for once dropping paratroopers from low altitude without parachutes into a snowy field, rationalizing that enough of them should survive the fall to cause menace behind enemy lines. ww2dbaseAfter leading units in the successful defense of Moscow, Zhukov wanted to launch a counteroffensive, but Stalin overruled his recommendation. He would not have his chance to successfully assault and defeat the Germans until winter of 1942-43, where a series of battles resulted in the first surrender by a German field marshal. In summer of 1943, he defeated the Germans in a tank battle at Kursk. Zhukov later led a successful campaign that eventually brought the Soviet troops deep into Germany, and capturing Berlin. Along with Field Marshal Ivan Koniev, he accepted the German surrender on behalf of the Soviets on 9 May 1945, two days after Germany surrendered to the western Allies. ww2dbaseThroughout the war, Zhukov maintained a girlfriend (Russian: pokhodno-polevaya zhena, or PPZh, "campaign wife"), Lidia Zakharova. He bestowed her, a junior officer in the Red Army, many medals and honors. ww2dbaseZhukov remained in Berlin after the war as a leader of the Soviet occupation forces. He became a friend of Eisenhower, and received the Chief Commander grade of the Legion of Merit from the American government for his contributions against the German forces. "I though Marshal Zhukov an affable and soldierly-appearing individual", said Eisenhower, who held the utmost respect for Zhukov as a soldier. "One day there is certain to be another order of the Soviet Union. It will be the Order of Zhukov, and that order will be prized by every man who admires courage, vision, fortitude, and determination in a soldier." Their friendship grew throughout the remainder of 1945, where Zhukov invited American representatives, including Eisenhower and his son John, to visit various locations in Russia, including the Kremlin museum. In Nov 1945, US-Soviet relations grew cold, and Zhukov turned down Eisenhower's invitation for him to visit the United States as the Soviet government returned to their state of distrustfulness toward the west. Very soon after, Stalin grew weary of Zhukov's popularity, and exiled him to a minor military district. He "was Stalin's favourite general - and also the stuff of which his nightmares were composed", said historians Anthony Read and David Fisher. Nevertheless, Zhukov briefly returned to a major post after Stalin's death in 1953, but his career once again hit a brick wall during Nikita Khrushchev's reign. Khrushchev accused him of disloyalty, and placed him under virtual house arrest in Moscow. ww2dbaseZhukov spent his final years writing his experiences in WW2 and the post-war period, but many of his writing were censored by the Soviet government. He passed away on 18 Jun 1974 at the age of 78. 2 Dec 1896 Georgy Zhukov was born in the village of Strelkovka, Russia. 31 Aug 1922 Georgy Zhukov was awarded the Order of the Red Banner for the first time. 16 Aug 1936 Georgy Zhukov was awarded the Order of Lenin for the first time. 5 Jun 1939 Corps commander Lieutenant General Georgy Zhukov arrived in the Mongolia Area of China, bringing reinforcement of armored cars, light tanks, and aircraft. 5 Jul 1939 Georgy Zhukov's counterattack forced the northern prong of the Japanese offensive to retreat across river Khalkhin Gol in Mongolia Area of China. 20 Aug 1939 Georgy Zhukov commenced a large-scale surprise offensive against Japanese forces in the Mongolia Area of China. 29 Aug 1939 Georgy Zhukov was made a Hero of the Soviet Union for the first time and was awarded the Order of Lenin for the second time. 26 Apr 1941 General Georgy Zhukov, the recently appointed Soviet Chief of Staff, ordered a creeping mobilization to begin, in response to widespread evidence that German forces were moving eastward. 12 May 1941 Despite Joseph Stalin's continual refusal to accept the numerous intelligence warnings that Germany was about to invade the Soviet Union, the Soviet Chief of Staff General Zhukov, on his own authority, ordered four Soviet Armies (8oo,ooo men) to forward positions at the border. 29 Jul 1941 Marshal Georgy Zhukov resigned as Chief of Staff of the Soviet forces. 13 Sep 1941 General Georgy Zhukov arrived in Leningrad, Russia to replace Marshal Kliment Voroshilov as the commanding officer of the city's garrison. 28 Sep 1941 Georgy Zhukov announced to his troops that family members of those who become captured by the enemy would be arrested and shot. 6 Oct 1941 In Russia, Georgy Zhukov departed Leningrad for Moscow to take command of Soviet Western Front. General Ivan Fedyuninsky assumed command at Leningrad. 10 Oct 1941 General Zhukov took command of a new Soviet Western Front, which was made up of the remnants of the former Western Front, the Southwestern Front, and the Reserve Front. He immediately called for the formation of a new defensive Mozhaysk Line to protect Moscow, Russia, stretching from Tula south of the city to Volokolamsk to the northwest. 22 Oct 1941 Georgy Zhukov took command of Soviet central sector. 27 Nov 1941 Franklin Roosevelt traveled to Warm Springs, Georgia, United States for a belated Thanksgiving holiday break. 28 Jan 1942 Georgy Zhukov was promoted, with responsibility growing to include the Bryanksk, Kalinin, and West Fronts. 27 Aug 1942 In addition to being responsible for the defense of Stalingrad in southern Russia, Georgy Zhukov was appointed as Stalin's First Deputy Commissar for Defense. 28 Jan 1943 Georgy Zhukov was awarded the Order of Suvorov 1st Class for the first time; this was the very first Order of Suvorov given out by the Soviet Union. 22 more Suvorov 1st Class medals were given out on this date after Zhukov's award. 28 Jul 1943 Georgy Zhukov was awarded the Order of Suvorov 1st Class for the second time. 10 Apr 1944 Georgy Zhukov was awarded the Order of Victory for the first time; this was the very first Order of Victory given out by the Soviet Union. 29 Jul 1944 Georgy Zhukov was made a Hero of the Soviet Union for the second time. 3 Nov 1944 Georgy Zhukov was awarded the Order of the Red Banner for the second time. 21 Feb 1945 Georgy Zhukov was awarded the Order of Lenin for the third time. 30 Mar 1945 Georgy Zhukov was awarded the Order of Victory for the second time. 1 Jun 1945 Georgy Zhukov was made a Hero of the Soviet Union for the third time. 10 Jun 1945 Montgomery and Eisenhower were decorated with the Order of Victory by Marshal Zhukov in Germany. 24 Jun 1945 General Zhukov took the salute in the Victory Parade in Moscow, Russia. 12 Jul 1945 Bernard Montgomery awarded Georgy Zhukov Knight Grand Cross of the Order of the Bath at the Brandenburg Gate, Berlin, Germany. 9 Sep 1945 Georgy Zhukov ordered his troops to stop committing crimes against the German civilian population; this order would be countermanded by Joseph Stalin on 20 Sep 1945 as the order was perceived to have failed to improve discipline. 1 Jun 1946 During a Soviet High Military Council meeting Joseph Stalin accused Georgy Zhukov of plotting. Zhukov was in turn demoted to head the Odessa Military District. 9 Jun 1946 Joseph Stalin issued a secret order to denounce Georgy Zhukov. 20 Jun 1949 Georgy Zhukov was awarded the Order of the Red Banner for the third time. 1 Dec 1956 Georgy Zhukov was made a Hero of the Soviet Union for the fourth time and was awarded the Order of Lenin for the fourth time. 1 Dec 1966 Georgy Zhukov was awarded the Order of Lenin for the fifth time. 22 Jan 1968 Georgy Zhukov was awarded a sword bearing a gold emblem of the Soviet Union. 22 Feb 1968 Georgy Zhukov was awarded the Order of the October Revolution. 1 Dec 1971 Georgy Zhukov was awarded the Order of Lenin for the sixth time. 18 Jun 1974 Georgy Zhukov passed away in Moscow, Russia. this was a good and helpful recource. this website is on my favorites list. What kind of watch did he like / was issued? Zhukov was probably the greatest field commander in the Second World War with a slight apology to Eisenhower and Montgomery. thank you mr georgy zhukov for your heroism tenacity and bravure on the fields of battle you have saved nor me but entirelly humanity from the nazi tirany,you are sure the most brave hero of the second world war together with american hero george patton,thousands thanks for both.!!! Zhukov did not accept the German surrender on behalf of the Soviets on 9 May 1945, two days after Germany surrendered to the western Allies. On 7 May 1945 Jodl signed the unconditional surrender of the German Armed Forces in Reims. On 8 May the allies signed in Berlin-Karlshorst the ratification of the surrender at Reims. Germany did not surrender, but the German Armed Forces. now mr georgy zhukov, you are one good leader, respect.